Join Girls FC as they show the world what it really means to play “like a girl”! "Hi! We're twins Dylan and Daisy McNeil. We're meant to write the match-reports for our football team, but we keep getting muddled – our granny says we're something called 'dyslexic'..." Daisy and Dylan love playing football, but their captain Megan isn't very happy when they make a mess of the match-reports. The twins can't seem to arrive on time for practice, either – though living in a chaotic household, which includes ballet-mad twin brothers and countless pets, certainly doesn’t help. Luckily, their Scottish granny knows just how they can turn things around! With an inclusive message, a diverse cast of characters and little in the way of competition, there's a clear gap in the market for Girls FC. 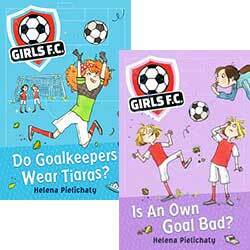 Girls FC: Do Goalkeepers Wear Tiaras? Girls FC: Can Ponies Take Penalties? Girls FC: Is An Own Goal Bad? Girls F.C. :#3 Are All Brothers Foul?